“Work At Home Special Report”, by Emily White, Kim Swartz, sometimes Melissa Johnson, and/or Mary Stevens, and found at theweeklyviral.com/res2/mnl.htm, weekly-jobs-report.com/landers/trv-ma/g/wfh/us/at53527/wjr/special-report.php, bettercareerpoint.com/lp/dsk/c/mnl.php, inwize.com/int/usa/nt.htm, upinfinance.com/int/usa/mel.htm, afternoonincome.com/lp/dsk/c/mnl.php, http://lifestyletribune.com, nycscope.com/res2/, theweeklyviral.com/d/tna.php, http://www.winnercareer.com/lp/c/bcam.php, nycscope.com/res2/bcad.htm and the latest, theweeklyviral.com/res2/mnl.htm, which now goes to Extreme Job Position, all with with a “byline” by fake reporter Amanda Winston, is a link posting scam with a sleazy news like angle. The scammers change the URL links constantly to keep consumer watchdogs like us on our toes, but we do our best to keep up as best as we can. Work At Home Special Report employs a frequently used phony news ad web design the scammers call an “advertorial”, short for advertising editorial, which would be a conflict of interest if it were a real news report, but it really is a fake news report. Everything on Work At Home Special Report is completely made up, there’s nothing real about it. Matter of fact, the disclaimer at the bottom of the page tells the real story. They do not even guarantee any kind of success with Work At Home Special Report. They even say that the site information is nonsense in roundabout legalese wording so they can get away with ripping people off. 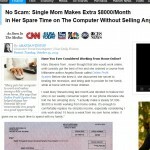 The Work At Home Special Report site design is also used in other ongoing scams with different fake working single mom names and stock photos. This site also mentions Angela Bussio, an infamously connected scammer whose team continues to deny she has never approved any of these scam sites’ use of her name and likeness. One huge problem is that, to the untrained eye, the sales page looks like a legitimate news report. That is what these scammers hope for, that newcomers fall for it. However, Work At Home Special Report is nothing but a scam. Even the fictional ‘work from home single moms Mary Stevens, Melissa Johnson and Emily White are not real people. Their hype of making big money with no experience or skills working only an hour a day is also a lie. The fake revenue check on the Work At Home Special Report front page is also doctored up. The reason is that you don’t ever get large checks like that when you post ad links. If you do happen to make any money doing it you will receive lots of small checks from the clients for which you advertise. That’s because when you work a link posting business, you will be getting paid from many different third party partners’ in much smaller check amounts. But the only ones making any money through Work At Home Special Report is the scammer who runs the site, and you won’t be able to see who that may be, their registered identities are always hidden by proxy. Earning a living from posting ads for different companies is really tough as the chances of someone clicking on the link and buying something is very slim. Work At Home Special Report first charges $99.95, and then if you try to exit the site, a pop up window slashes the price in an effort to entice you more. Even then you’re still paying too much. Don’t feel like you’re lucky getting the discount. It’s just a trick to get you to join and give up your personal data and banking info so they can proceed to do their shady activities. There are affiliate marketing programs that you can make money online from home with but Work At Home Special Report is not one of them. Most of the honest ones don’t charge a fee, let alone one so high. Once you give up your credit card number and personal data, Work At Home Special Report unleashes a sales team on you that calls you constantly. Their goal is to get you buying in the tens of thousands on business coaching upsells that never give you any value whatsoever. Work At Home Special Report has no refund policy and trying to get your money back is impossible is through and they’ve gotten you spending thousands of dollars for virtually nothing in return, it will be too late for you! Everybody at Work At Home Special Report that hounded you until you spent all your money suddenly vanishes and won’t be reached for support no matter how you try. Many unfortunate people have written to us about getting ripped off by the criminals who run sites just like Work At Home Special Report so don’t be one of them. Also, please stay away from the site it redirects you to, Work At Home Source, which we have reviewed elsewhere on ScamXposer. It is another nightmare scam. Work At Home Special Report is a horrible work from home scam hiding as a fake news site that you are better off avoiding. It’s all a scam people!!! I promise.